Huntingtower Castle has two fine and complete towers, built in the 15th and 16th centuries and joined by a range in the 17th century. There is a fine painted ceiling in the hall of the eastern tower of Huntingtower Castle. The splendid painted ceilings are especially noteworthy in this castle, which was once owned by the Ruthven family who held James VI captive here for 10 months. 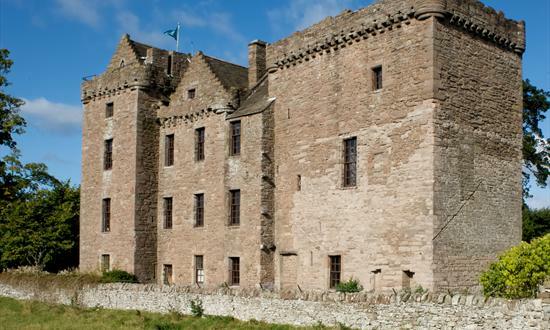 Huntingtower Castle was a lordly residence for 300 years, from the 15th to the 18th century. It is associated with two noble families: the Ruthvens (later earls of Gowrie) and, following their downfall in 1600, the Murrays (earls of Tullibardine and later dukes of Atholl). Prior to 1600, Huntingtower was known as the Place of Ruthven. Huntingtower has hosted some famous visitors, and been associated with some dramatic events. Mary Queen of Scots stayed here in 1565, during her honeymoon with Lord Darnley. In 1582, Mary’s son, James VI, was held here against his will by the 1st Earl of Gowrie, in a famous episode known as the ‘Ruthven Raid’. With the downfall of the 3rd Earl in 1600, in an equally bizarre episode called the ‘Gowrie Conspiracy’, the Ruthvens were disinherited and their forfeited castle was renamed Huntingtower.